While lithium and uranium markets were depressed in 2018, a rebound could occur, as demand pressures for both metals grow in the years ahead. Here’s a look at eight juniors that are active players in lithium and uranium exploration and development. Toronto-based junior Appia Energy (CSE: API; US-OTC: APAAF) is involved in uranium and rare earth element (REE) exploration in the prolific Athabasca basin district of northern Saskatchewan, and uranium and REE development and mining in northern Ontario’s historic Elliot Lake mining camp. Appia is led by president and CEO Anastasios (Tom) Drivas, who is described as a business entrepreneur with over 30 years of experience in various industries, including more than 20 years in the mineral resource industry. He is also president and CEO of Romios Gold Resources, a publicly traded company founded in 1995. Geologist James Sykes is Appia’s vice-president of exploration and development, and has previous work in the Athabasca basin related to NexGen’s Arrow deposit and Hathor’s Roughrider deposits. Appia’s REE project in the Athabasca is named Alces Lake and is located east of Uranium City. The company describes Alces Lake as the highest-grade REE occurrence known in Saskatchewan, with grades comparable to those found in South Africa’s world-class Steenkampskraal deposit. In mid-2018, Appia completed the first-ever drill campaign on the property, with 15 holes confirming depth extension of high-grade surface REE mineralization. Appia plans to return to Alces Lake in 2019 with a $1.5-million exploration program. Appia’s uranium properties in the Athabasca include Loranger, Eastside and North Wollaston — all in the Wollaston Lake area. In December Appia raised $1.4 million for exploration work this year at Loranger and Alces Lake. Fission 3.0 (TSXV: FUU; US-OTC: FISOF) is a Canadian-based uranium project generator with a portfolio of prospects in the Athabasca basin, as well as a property in the emerging Macusani uranium district in southeastern Peru. The company’s management is headed by CEO and chairman Dev Randhawa and chief operating officer and chief geologist Ross McElroy, who both founded and still run Fission Uranium, which discovered the Patterson Lake South (PLS) high-grade uranium discovery, where advanced exploration and development work is ongoing. A drill rig at on Fission 3.0’s Patterson Lake North uranium project in Saskatchewan. Credit: Fission 3.0. Earlier, the same team also founded Fission Energy, which made the J-Zone high-grade uranium discovery in the Athabasca basin, which was sold to Denison Mines. Fission 3.0 was created by spinning off grassroots uranium projects from Fission Uranium so the parent company could focus its attention on PLS. 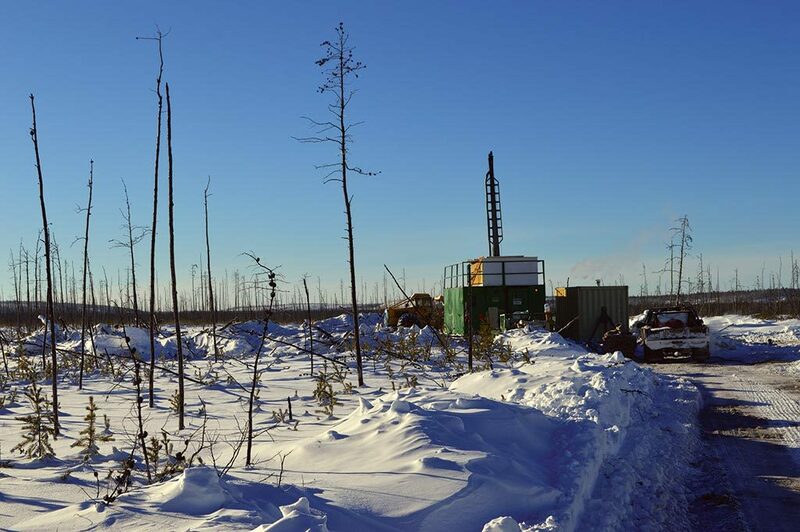 In January, Fission 3.0 started a 1,850-metre, five-hole drill program at its PLN project, located north alongside Fission Uranium’s PLS. The junior says the program will focus on targets within a 700-metre mineralized corridor found by previous drilling. Fission 3.0 plans to drill 3,250 metres at PLN this year. Sudbury, Ontario-based Frontier Lithium (TSXV: FL; US-OTC: HLKMF) is exploring its Pak lithium deposit in what it calls “Electric Avenue” — a “newly emerging, premium lithium-metal district,” hosted in the Canadian Shield of northwestern Ontario. Frontier describes the deposit as having lithium in a “rare, high-purity, low-iron spodumene” that is analogous to the Greenbushes deposit in Australia. The Pak deposit has a measured and indicated resource of 7.5 million tonnes of 2.02% Li2O and an inferred resource of 1.8 million tonnes of 2.10% Li2O, which has a technical, ceramic-grade spodumene with low inherent iron (below 0.1% Fe2O3). The junior recently found a lithium-cesium-tantalum pegmatite showing called Spark, which at surface shows a channel cut with similar grade and composition to Pak. The surface exposure of the discovery is three times larger than the Pak pegmatite, with widths greater than 100 metres and a strike length exceeding 300 metres. Frontier’s goal is to “become a low-cost, fully integrated lithium producer” by developing Pak, where it has already completed a prefeasibility study to assess the economic viability and technical feasibility of producing lithium concentrates.